Flu activity is high across most of the country with flu illnesses, hospitalizations and deaths elevated. Flu season will probably continue for several weeks. While the flu vaccine is not working as well as usual against some H3N2 viruses, vaccination can still protect some people and reduce hospitalizations and deaths, and will protect against other flu viruses. Influenza antiviral drugs can treat flu illness. CDC recommends these drugs be used to treat people who are very sick or who are at high risk of serious flu complications who have flu symptoms. Early antiviral treatment works best. The Medical Office Telephone Evaluation flowchart is designed to be used when influenza is circulating in the community. 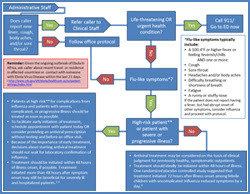 This tool may help medical office staff triage calls from patients with flu-like symptoms and identify when it might be appropriate to initiate antiviral treatment before an office visit.